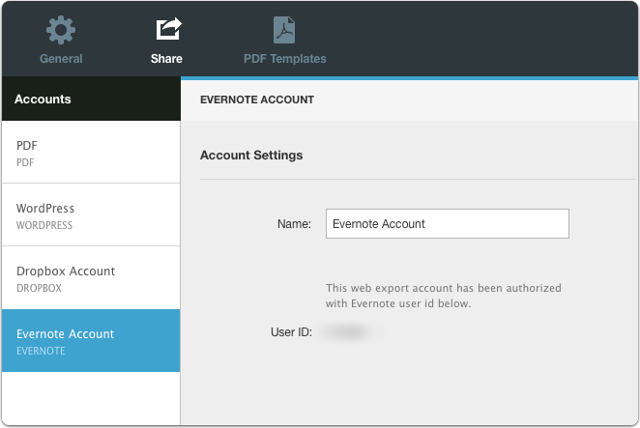 Clarify can export your documents to Evernote. The Evernote integration is unique amongst other services that Clarify exports to in that the Clarify source file will be stored with the note that is created in Evernote. This allows you or your team to modify the note from within Clarify at a later date without having to search for the source file. 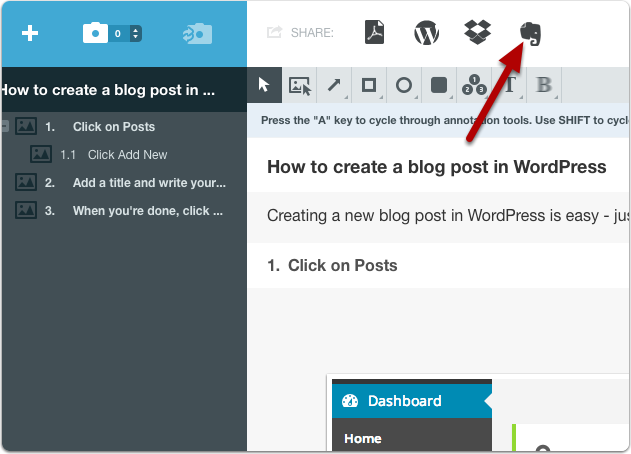 From the Share tab, click on the + button and select Evernote. In order for Clarify to add content to your Evernote account you must give permission. 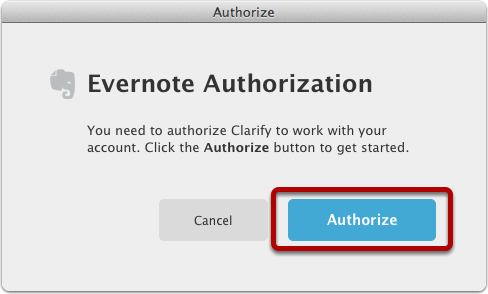 Click the Authorize button to start the authorization process with Evernote. After logging into Evernote you will be presented with this screen. 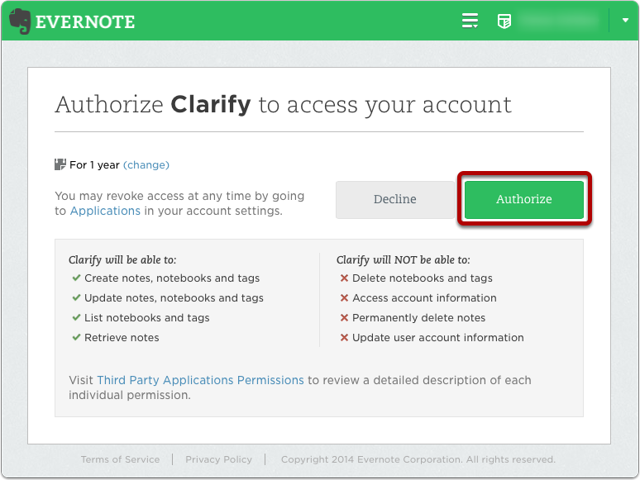 Click the Authorize button to give Clarify permission to create content in your Evernote account. 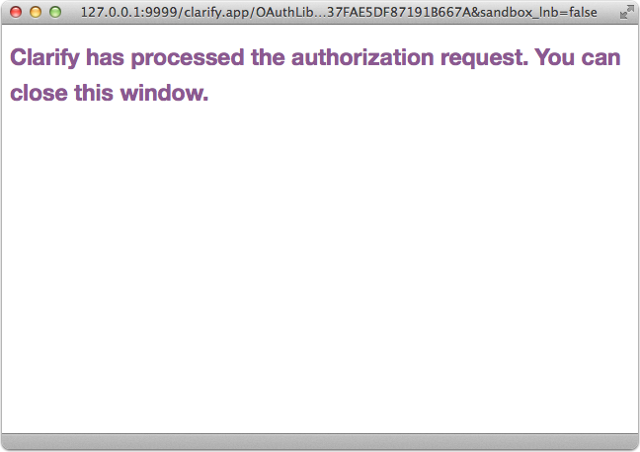 You should then see this screen in your browser window if Clarify was able to successfully authorize with Evernote. If, after clicking the Allow button on the Dropbox or Evernote site, Clarify does not create the sharing account it may be because another application is listening on the same PORT on your computer (currently Clarify uses port 9999). We have had one report of Clarify not being able to finish creating an account if Extensis Portfolio is running. If you quit Extensis Portfolio you should be able to create the sharing account. After you have created the sharing account you can run Extensis Portfolio and Clarify together without any issues. You will now have an Evernote sharing account in Clarify. An Evernote icon will now appear in the Share toolbar in your Clarify documents. When you are ready to export a document to Evernote, click on it. In the Evernote export dialog you can specify the name of the note as well as which notebook to store the note in. You will see both personal and business notebooks listed and you can create the note in either type. Once you have selected a notebook click the Save button. 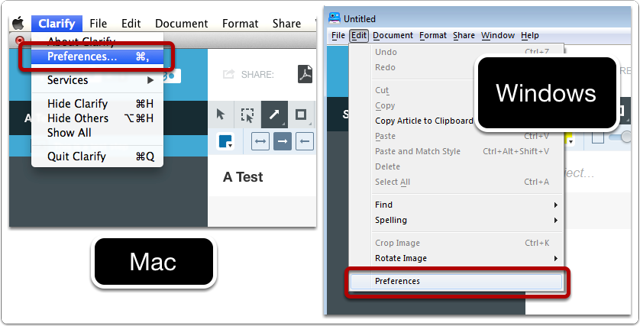 Clarify will create the note in Evernote and attach the Clarify source document to the end of the note. Note: If you export the Clarify document to Evernote again you will have the option of moving the note to a different notebook. You will not be able to move a note from a business notebook to a personal notebook or vice versa. You will see this message after the upload is finished. 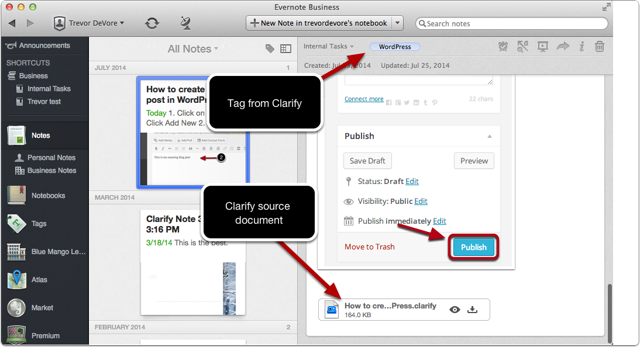 Clarify will store the Clarify source document at the end of the Evernote note. This means anyone with access to the note can update the note using the Clarify source file at a later date. 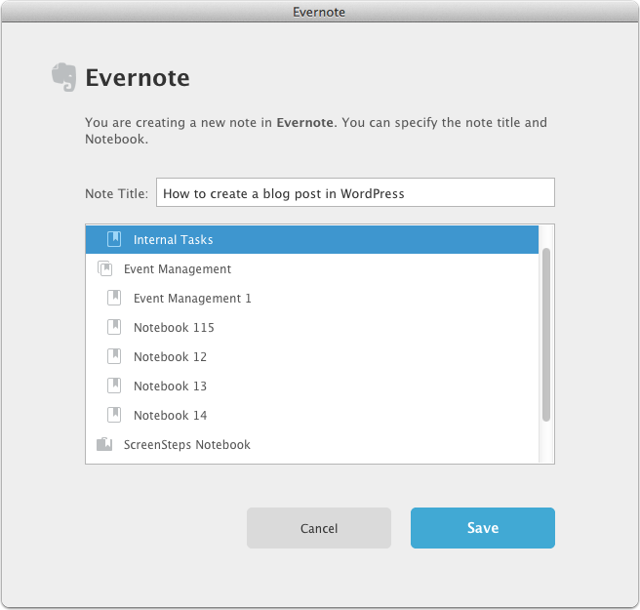 If you sync your Evernote desktop client you will see your note appear. Any tags you assigned to your Clarify document will be assigned as a tag in Evernote. The source document appears at the end of the note. 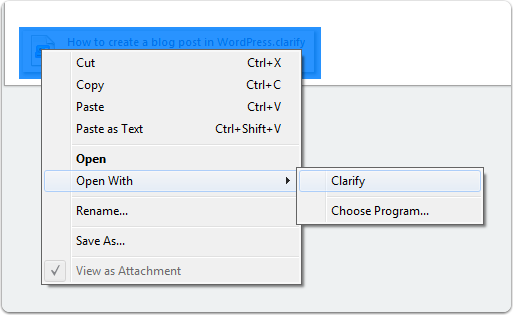 To edit the note, right-click on the source file and select Open With > Clarify. 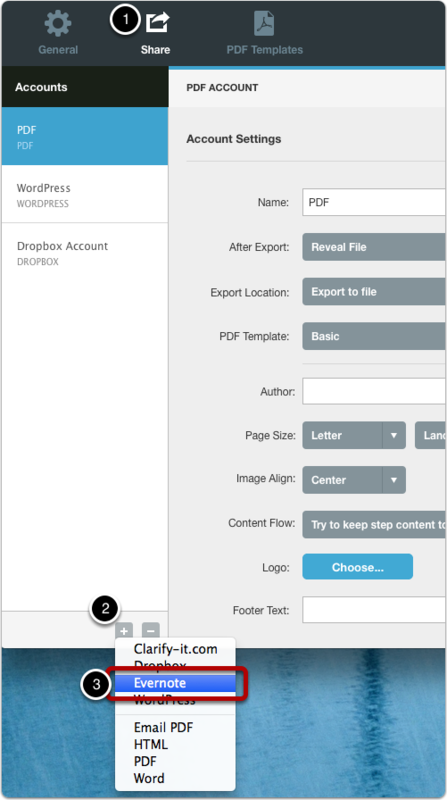 Next: Why does my document need to be saved after exporting to a web sharing account?